I played a game with my 4 babies to get them to look me in the eyes. I’d lay them on their backs and move my head in front of their face directly in their line of sight. They’d casually move their eyeballs around to look away from me. It was so amusing. Almost no matter how hard I tried I couldn’t get them to look me in the eyes for more than a split second. Grace was an exception. She’d look at me like this all the time. I decided one afternoon to photograph her looking at me. 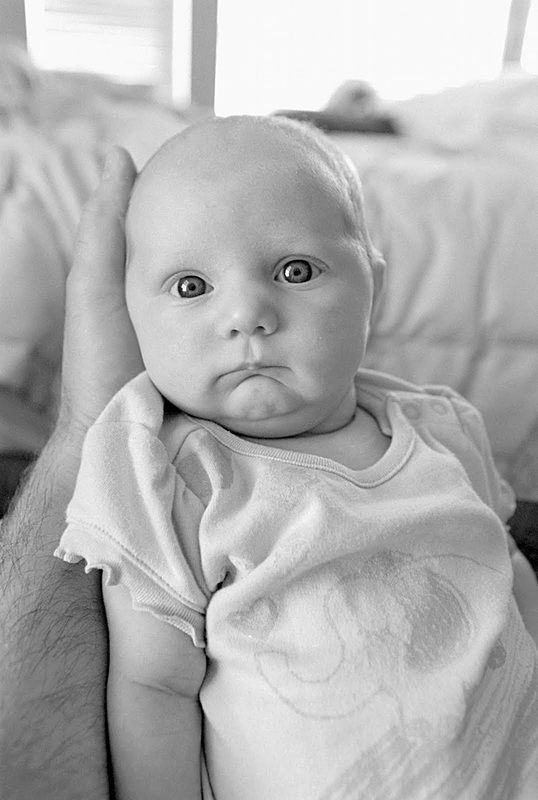 She gave me one of the most complex expressions I’ve ever photographed on a 3 month old. What is her expression saying? I think you are right! Finally, the mystery is solved. I love this picture!!!! Amazing! Ok…now this is my favorite post! everyday a new fave! i just love grace! It’s like looking in a mirror almost sixty years ago! But she is adorable then and now. BTW…I miss the photo tips!